At first, everything in the Universe was love and harmony. Every being loved and trusted all other beings. No being had ever died. No being had ever even dreamed about war. Everything was love! The Universe served God because of love and trust for God. God knew what was best for the Universe. But, for some reason -- that can never be fully understood here-- something changed in Lucifer’s heart and mind. He began to question God. Lucifer questioned God’s laws. Why couldn’t the angels all decide for themselves what was love? Why should there be "laws" in the Universe? Lucifer wondered...he questioned. Lucifer became proud of his beauty. He became proud of his own ideas and opinions. Lucifer wanted to be "like the Most High" [God]! Lucifer claimed that he had new ideas which would bring a new type of liberty and freedom to the angels and to the Universe. All heaven was upset. Was this true? Lucifer began to say that not only was there a better way, but that God was unfair. Finally Lucifer accused God of being a tyrant (wicked, selfish leader)! 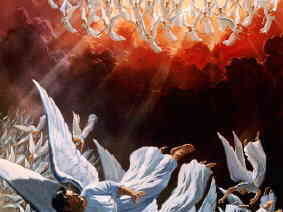 Many angels listened to Lucifer and also began to question God. The Father and Jesus met with the angels and tried to persuade the angels in the "rightness" of God’s ways. The Father and Jesus tried to show that they are truly love. 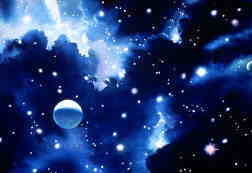 God's laws are the explanation of love in the Universe. But, Lucifer’s arguments were clever and powerful. 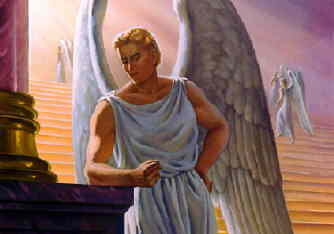 The angels could not see where all these arguments of Lucifer would lead! Why didn’t God just quietly kill Lucifer and stop sin before Satan talked to anyone? Up to this time, all created beings had served God because of love, not fear. Before Lucifer sinned, all created beings served God because they wanted to. If God killed Lucifer, the created beings would serve God because of fear that God would kill them too. So, God would have to "let sin continue" until the whole Universe could see for themselves how bad and terrible sin really was. Yes, God would some day have to bring sin to an end. But, God could not do it while His love and reputation (character) were questioned. God would have to prove His love through the terrible experience of sin. It was when God was planning the creation of our world, that jealously, pride and sin came into Satan’s heart. Satan wanted to be included in the planning, but he was not God. The Bible says that Satan was put out of Heaven to our world. How and when is not fully made clear. After Satan was put out, Satan and his angels must have watched carefully what God would do next! Now that sin had started in the Universe, would it spread beyond the one-third of the angels that chose to be with Satan? Could Satan grab power in the new world he know God was ready to create? Go to the Next Section: God Creates a New World to find out what happened.